Lewis Eldin. Photo: David Dales. Boston Rugby Club made it six from six as they recorded another impressive away win, this time away to second-placed Cleethorpes, writes John Fletcher. 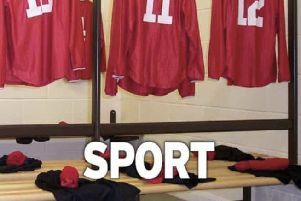 It was Cleethorpes’s first home defeat in two years. 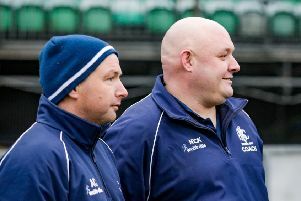 On a bitingly cold day both teams looked to play an expansive game and coach Ashley Coates knew this would provide a stern test of the team’s character and credentials as they look to secure a top-four finish in the Midlands 4 East (North). The opening 10 minutes proved to be a cagey affair with both sides sizing each other up. A feature of the match would be Boston’s dominant scrum and defensive line speed, which put the normally free-running Cleethorpes backs under constant pressure. On 12 minutes, from scrum ball won against the head, captain Lewis Eldin drove into the Cleethorpes defence. Possession was quickly recycled and a flowing backs move saw winger Michael Baldwin score in the corner. The home team were then penalised for an infringement in the loose, and a fantastic touch kick by fly half Matthew Bray set up an attacking lineout 10 metres from the Cleethorpes line. A well-executed catch and drive saw back row Dave Cotton-Betteridge score Boston’s second try, converted by Bray, to put the visitors 12-0 in front. Cleethorpes quickly responded with a well-worked try from a poor re-start, but a further Bray penalty saw the Blue and Whites enter half time 15-5 ahead. Boston started the second half impressively and, in the first 10 minutes, missed one clear scoring opportunity, had a try disallowed, and had two missed penalty attempts. However, a long-range penalty by Bray five minutes later eased the travelling spectators’ concerns and, at 18-5 up, fresh legs were brought on, Marc Miles for Luke Fowler in the back row, Will Scupham for Paul Beard, and Harry Woods for Baldwin. A yellow card for prop James Griffin saw Boston having to negotiate a tough 10-minute spell with 14 players, but their defensive structure and resolute tackling held firm and a final long-range penalty from Bray saw Boston close out a deserved win and gain revenge for their earlier defeat at home to Cleethorpes. Boston’s man of the match was number eight and captain Lewis Eldin. On Saturday Boston entertain league leaders East Retford (KO 2.15pm). BOSTON: Hough, Beard, Griffin, Coley, Sharp, Cotton-Betteridge, Fowler, Eldin, Borley, Bray, Baldwin, T. Andrews, J. Andrews, Cowern, Hobbs; replacements: Kippax, de la Fontaine, Woods, Miles, Scupham. Boston’s Development XV made it a winning weekend for the club in a hard-fought match. They beat Cleethorpes Seconds 14-10 at the Princess Royal Sports Arena. On Saturday, the team travel to play Nottinghamians.